Lithium hydride is an inorganic compound with the formula LiH. This alkali metal hydride is a colorless solid, although commercial samples are grey. Characteristic of a salt-like, or ionic, hydride, it has a high melting point and is not soluble but reactive with all organic and protic solvents; it is soluble and non-reactive with certain molten salts such as lithium fluoride, lithium borohydride, and sodium hydride. 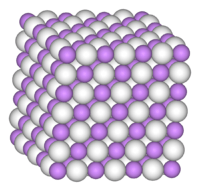 With a molecular mass of slightly less than 8, it is the lightest ionic compound. Cracking in cast LiH after machining with a fly cutter. Scale is in inches. With a hydrogen content three times that of NaH, LiH has the highest hydrogen content of any hydride. LiH is periodically of interest for hydrogen storage, but applications have been thwarted by its stability to decomposition. Thus removal of H2 requires temperatures above the 700 °C used for its synthesis, such temperatures are expensive to create and maintain. 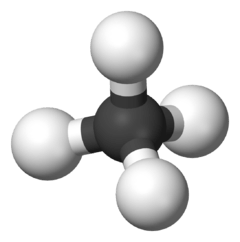 The compound was once tested as a fuel component in a model rocket. Lithium hydride is used in the production of a variety of reagents for organic synthesis, such as lithium aluminium hydride (LiAlH4) and lithium borohydride (LiBH4). Triethylborane reacts to give superhydride (LiBHEt3). LiH is a desirable material for shielding nuclear reactors and can be fabricated by casting. LiH, especially lithium-7 deuteride, is a good moderator for nuclear reactors, because deuterium has a lower neutron absorption cross-section than aneutronic hydrogen, decreasing neutron absorption in a reactor. Lithium-7 is preferred for a moderator because it has a lower neutron cross-section and also forms less tritium under neutron bombardment. The corresponding lithium-6 deuteride, formula 6Li2H or 6LiD, is the fusion fuel in thermonuclear weapons. In warheads of the Teller-Ulam design, a fission trigger explosion heats, compresses and bombards 6LiD with neutrons to produce tritium in an exothermic reaction. The deuterium and tritium (both isotopes of hydrogen) then fuse to produce helium-4, a neutron and 17.59 MeV of energy. Before the Castle Bravo nuclear test, it was thought that only the less common lithium-6 isotope would breed tritium when struck with fast neutrons. The test showed that the more plentiful lithium-7 also does so, albeit by an endothermic reaction. 1 2 3 Lide, D. R., ed. (2005). CRC Handbook of Chemistry and Physics (86th ed.). Boca Raton (FL): CRC Press. p. 4.70. ISBN 0-8493-0486-5. ↑ David Arthur Johnson; Open University (12 August 2002). Metals and chemical change. Royal Society of Chemistry. pp. 167–. ISBN 978-0-85404-665-2. Retrieved 1 November 2011. 1 2 3 4 5 6 7 8 9 10 11 12 13 14 15 16 17 18 19 20 21 22 23 24 25 26 27 28 29 30 31 Smith, R. L.; Miser, J. W. (1963). Compilation of the properties of lithium hydride. NASA. ↑ "Lithium hydride". Immediately Dangerous to Life and Health. National Institute for Occupational Safety and Health (NIOSH). 1 2 3 "NIOSH Pocket Guide to Chemical Hazards #0371". National Institute for Occupational Safety and Health (NIOSH). ↑ Lex. Astronautix.com (1964-04-25). Retrieved on 2011-11-01. ↑ Empirical laws for hybrid combustion of lithium hydride with fluorine in small rocket engines. Ntrs.nasa.gov. Retrieved on 2011-11-01. ↑ Peter J. Turchi (1998). Propulsion techniques: action and reaction. AIAA. pp. 339–. ISBN 978-1-56347-115-5. Retrieved 2 November 2011. ↑ Welch, Frank H. (February 1974). "Lithium hydride: A space age shielding material". Nuclear Engineering and Design. 26 (3): 440–460. doi:10.1016/0029-5493(74)90082-X. Look up lithium hydride in Wiktionary, the free dictionary.